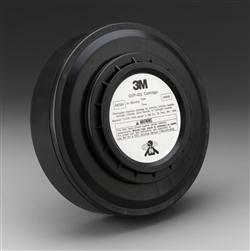 This cartridge is used with the 3M(TM) Belt-Mounted and Vehicle-Mounted Powered Air Purifying Respirator (PAPR) Systems. It attaches to the motor blower and filters the air supplied to the headgear. Jaco Aerospace and Industrial is your one stop resource for 3M(TM) Acid Gas Cartridge GVP-402 6/Case and all of your 3M Products, Tapes, aerospace and industrial needs. SKU Marketplace Product Description: This cartridge is used with the 3M(TM) Belt-Mounted and Vehicle-Mounted Powered Air Purifying Respirator (PAPR) Systems. It attaches to the motor blower and filters the air supplied to the headgear.